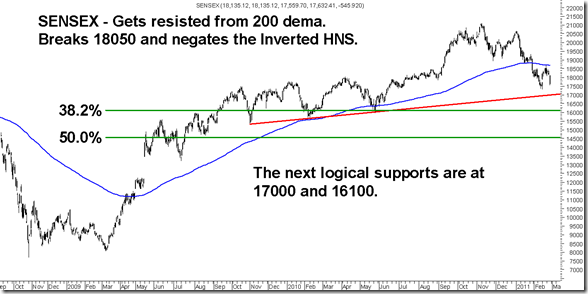 Possible Inverted Head and Shoulders Negated – Will it head to 17300 or lower? Yesterday we had discussed a possibility of an inverted head and shoulders in making which as suggested to be WISHFUL THINKING ended up being so. The test of 200 dema and a subsequent fall confirms the continuation of the downtrend. The volatility index has broken out and is headed to 30-32 though i do expect this vols will go down on budget day. But seeing that the market is too light and drops could be sharp as it was today i would wait and watch, take a call only after budget. In the last randomn thoughts and before that have been mentioning that 17300 could be tested or may even be broken. According to Elliot Wave there is one last wave down left before a strong bounce back comes in. Although it can go all the way to 4800 as per possible wave counts. Now on the positive side the next fall may stop either at 17000-17300 or go all the way to 16100 ( Worst case scenario). After todays drop any quick drop in next few sessions would ideally create a positive divergence and a good opportunity to bottom fish. Technically the very strong trendline comes at 17000. But in a down trending market no supports are sacrosanct and can be broken. But one needs to wait for some confirmatory signals after the bottom formation. So for now next logical supports are 17300/17000 and 16100. The view remains that 17300 levels could be tested or broken till March end but we may soon be nearing a nice intermediate bottom followed by a steady bounce back. We would be watching how markets react near 17.3-17k or where this down leg ends. While going through a simple screener of dividend yield on many stocks the list of stocks showing a possible 3-7% dividend yield the list is pretty long. Even a large cap stock like Ashok Leyland is at current market price quoting at 3.3 % dividend yield. So any further drops to 40 or lower will take the dividend yield beyond 4%. The stock has been giving 100-150% dividend consistently since 2005. Many other small cap stocks are almost at 5-7% dividend yield with consistent record of dividends for 5 years. Will be listing few of the stocks if markets do fall in coming days. Some stocks which came up Andhra Sugars, Visaka Inds, Cosmo Films, Mirc Electronics came in a quick screening. Would like more thoughts from fellow readers who do track some defensive stocks. DELHI ONLY 2 SEATS LEFT. Best time for Advisors to show Performance Reports/CAGR to sell their services – Part 1.
we have seen in 2004 and 2006 index dropped by 25-30% from top and we saw secular bull run there after. Will we see same kind of move after crash which we saw in 2004 and 2006 crash. ?????? According to me the Wave C is in progress which has few more legs but i generally wait for a change of wave count to get in. Like at 19900/19000 it was a good situation where B was to be over. So now above 19k-19.6k or a faster retracement of few legs will confirm C over. But it has ideal targets of 17000/16100. Will have a look into Aarti Inds it came into my screener too. Blue chips like Tata Motors there is huge profit booking as earlier there was parabolic rise.So it is phase of pinning down blue chip parabolas and bring down to a level where vertical rise started.With this liquidity will dry in small caps and they will have time correction may be for two months.Smart money accumulates parabolic down slope so a long period of consolidation is ahead.Smart money scatters nails at bottom to avoid third party touching their domain.I am thankful to you that you are doing your best to make small investor smart.Timing the exact market no body can predict but certain bloggers do provide sufficient hints.A foreign blogger gicharts dot blogspot dot com provided hint before fall and now in latest post has remarked about Tata Motors.With best wishes. Yes exitting is a major problem but i still believe this is a long term bull market but next few months wont be great. What is ur view on infra stocks ? HOV Services will probably have a dividend yield of 10% at 80. But it has a track of only 1 year. In dividend history we are looking out for safe and stable cos.
some of divedend stocks worth pondering are.. There is a saying by ” Jab Dard had se zada bhad jata hai…. Tabh uski dawaye banti hai….. What will not kill you will make you stronger………So i think soon we should expect the markets to bounce ……. Thanks for your regular posts. 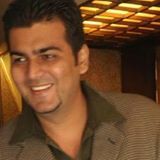 During Diwali you suggested Indage Resturants as one of the High Risk Pick. I got 1000 shares at 9 Rs and it is delisted now. Do you have any news with you to re-list again or my money is gone. The stock gave an exit at 9 bucks before getting delisted. Me took a 50% hit on the stock 🙁 It was supposed to be a very high risk pick. The company has not adhered to listing agreements. Consider it to be gone unless company tries for re-listing after a few years.